Yesterday I talked things about making sure that you are running a business that you love so today I’m going to cover more for the people who may not have that business yet and are at the very early stages. 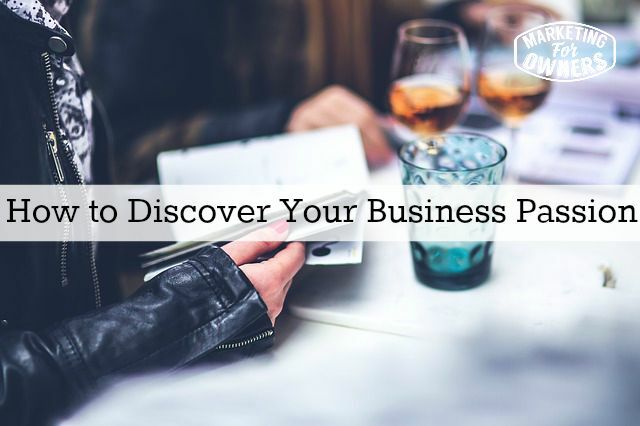 So how to discover your business passion? It’s a very important subject because like I said yesterday, you want to be doing something you love so why not start off on the right foot? Now what makes you thrive? What makes you tick? What do you love? Jennifer for instance, her daughter, who is only seventeen, she’s an artist. She just loves art and everything to do with it and she’s taken her artistic skills to build a business by painting murals for local churches. Her work is blowing up in leaps and bounds and she adores it and at such an early age. That is fantastic. She’s going to go so, so far. So how do we work this for the rest of us? Let me give you some tips and tricks. So first of all don’t think too hard about it. If you try and figure out, if you have to figure out, if you don’t have anything in mind, it’s not going to work. I mean, the analogy I give to this is, for example, people end up with the love of their life. They get married, have a relationship. They can end up with the love of their life but the vast majority of those people met up by accident somewhere. It wasn’t planned. It just happened. Now for others who try to meet the love of their life, they may go on a dating agency or go to bars or singles club or things like that. It’s a bit too forced. It’s just not as natural. Now it might work out but it’s not as natural so you can write out lists of did you have hobbies when you were younger and all that stuff but to be honest, it’s there. Just think about what you enjoy doing. Not too hard. Next one is, do it but do it for free and see if you enjoy it. Now for instance say with the painting murals at churches. Don’t set up your entire business and get on with it. See if you’re going to enjoy it first. Go to some churches, offer the service and do it and see how you get on. See how your clients make it on. Do they enjoy working with you? Is this something you think you can do for a business? You’ll be amazed how often that’s going to work and get you a great job and the best training you can ever get. Now I mentioned earlier hobbies, do you have a hobby? Did you have a childhood love or something that you did in your spare time when your other friends were out playing football or doing whatever. Did you have something that you preferred to be doing? Does that apply to business? Can that apply? Think back. Write these things down. Did you have any inspirations? Anybody you’d like to follow? Particular genres of TV programs? No, no I am not expecting you to want to be an astronaut or something like that but then maybe something that you like. You may have loved watching cooking programs for instance. Do you want to be some kind of chef or run a restaurant or something like that? Don’t forget you don’t have to be a chef to run a restaurant. Who do you want to be like? Do you have heroes and heroines? What do they do? What are they like? What characteristics do you like about them? Now I’m not talking about a celebrity. No you don’t want to be like Justin Beiber or perhaps you do but it’s not going to work. I don’t mean that. I don’t mean reality TV. I mean people around you. People you look up to. It maybe in a teacher at school, it maybe someone in a club, it maybe somebody at your church, it maybe someone that you just know from down the pub. What characteristics and traits do you like about them? Do you have the same? And then what working conditions or environment do you want? For instance, if you’re going to be a software engineer, you are likely to be pinned to a laptop or a computer or desk somewhere indoors possibly in a cubicle wherever it is. But do you like the fresh air? Would you rather be running a surf shop on a beach in Tahiti? Yes, I am sure you want but you might not make a lot of money doing that but did you want to be in the construction industry? They work outdoors? Do you not like the cold? Things like that. Think of what you work in, do you want to work with animals? Likely to be outside but if you prefer to work indoors it’s not going to work. You’ve got to think through these things. Find a passion. Find it. Look for inspiration. It’s there. Do not expect it to come overnight and do not force it. It’s going to work. Okay good luck. The fact that you’re listening to this and making notes is a fantastic start and I love you already. Now it is Thursday and this one’s for the ladies. 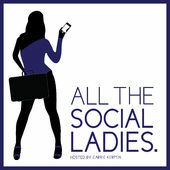 It’s time for a drive time podcast and today we’re going to mention “All the SocialLladies” by Carrie Kerpen. Now if you’re thinking, oh that name sounds familiar, is because Carrie is the wife of Dave Kerpen of Likeable Social Media. I think their business is Likeable Media, likeablemedia.com probably but just look up Likeable Media, you’ll find she is the CEO and because of that she knows some fantastic ladies and people in general in Social Media and she interviews top guests. I like her. She has good delivery. She knows a lot about Social Media herself but she gets good guests and finds out some good stuff to learn: tips, tricks, small brands, large brands all that. So well worth a listen and you’re going to learn a lot from her, something you can probably apply to your social media strategy. So remember “All the Social ladies” Carey Kerpen.